Every year I ask the best chefs and cookbook authors to send me their healthiest and tastiest spring recipes. The requirements are that they use whole ingredients, are low calories, and, of course, tasty. See what you think. Black beans make for a hearty vegetarian burger that eats like a regular burger. Serve on crusty bread or a hamburger bun with spicy mustard, pickles, and greens (arugula works nicely). 1. Preheat the oven to 375°F. Line a baking sheet with parchment and a bit of oil or cooking spray. 2. In a large bowl or food processor, pulse the beans until mostly mashed, while still maintaining some bits of bean. 3. Add all the remaining ingredients except the eggs and olive oil, and taste for seasoning; adjust as necessary. Add the eggs, pulse to combine, and let sit for about15 minutes. During this time the panko will soak up a bit of the moisture. The mixture will be wet but still able to form a patty, similar to ground meat. If the mixture feels dry at all, add a bit of olive oil to moisten. If too wet, add a bit more panko. 4. Form four patties and place on the prepared baking sheet. Bake for 10 to 15 minutes on each side. 1. Set oven control to broil. Cut 12 slices from cucumber; set aside. Chop enough remaining cucumber to equal 1/2 cup; place in small bowl. Stir in yogurt, onion and mint. Refrigerate until serving time. 2. In large bowl, mix chicken, spinach, olives, cornstarch, oregano, garlic, salt and pepper. Shape mixture into 4 oval patties, ½ inch thick. 3. Place patties on broiler pan. Broil with tops about 5 inches from heat 10 to 12 minutes, turning once, until thermometer inserted in center of patties reads 165°F. 4. Place 1 burger in each pita half. Add tomato and 3 reserved cucumber slices to each pita half. Serve with tzatziki sauce. This salad is the perfect way to use the chicken from making chicken broth. 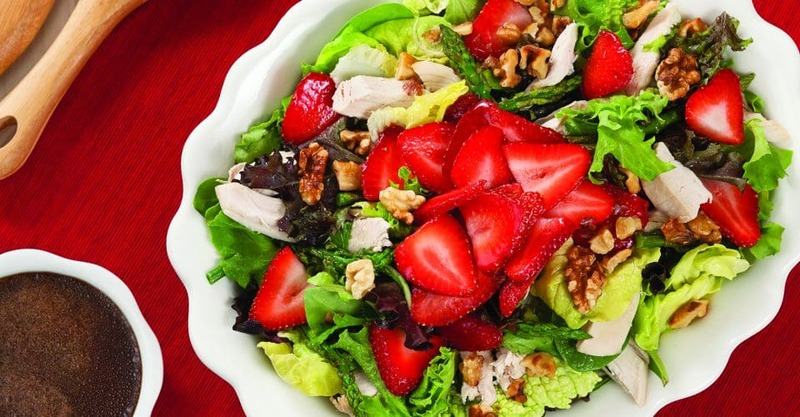 You’ll love the zing of berry flavor and the crunch of the walnuts, and you’ll want to make more broth just so you can eat this salad again and again! Or, to make things really easy, use the meat from a pre-cooked rotisserie chicken, preferably an organic one. Preheat the oven to 350 s F.
Prepare the asparagus by breaking off and discarding the tough ends, and cutting the asparagus into 2 inch pieces. Place the asparagus on a baking sheet in a single layer and drizzle with 1 tablespoon of the olive oil; toss to coat. Season with salt and pepper to taste and roast in the preheated oven for 15 to 20 minutes until just crisp. Remove from the oven and let cool. Using a small bowl whisk the remaining 2 tablespoons of olive oil with the lemon juice and balsamic vinegar. Season with salt and pepper to taste. In a large salad bowl, combine spinach and spring mix. Toss to combine the salad greens. Add the asparagus, strawberries and chicken. Pour the dressing over all and toss to thoroughly coat all the ingredients. Divide among 4 bowls and sprinkle with toasted nuts. Tip: If strawberries aren’t in season, raspberries or another berry will be equally as delicious.